Transform Your Life... Connect Your Work to Who You Really Are! Find work that matches you! Kindle and Nook versions available. "I really like Michael Linenberger's strategies, he's come up with very realistic and meaningful ideas for productivity. I like that he's also spent a lot of time on goals and motivation, which I really love. I highly recommend this book!" "Best in class. ... the approach is a revelation. 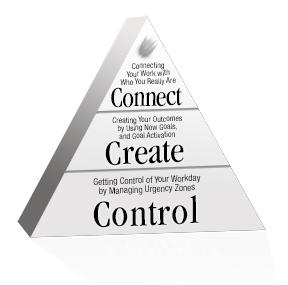 Starts out with daily time management and works up to life management that is consistent with daily plan. Intuitively appealing"
"I daresay this is the best book on workflow management I've ever read -- and I've read a LOT of books on that subject. I predict that this book is going to be a huge hit and a long-term classic in its field." "Michael's Total Workday Control was astounding. 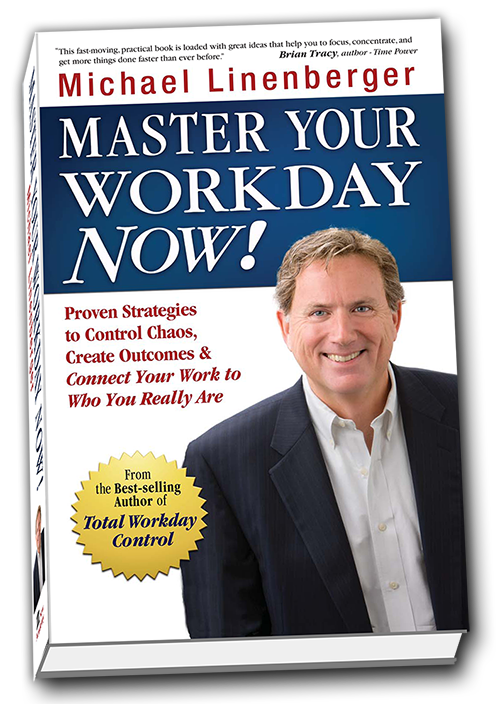 Never considered that he could top Total Workday Control, but he has with Master Your Workday Now!" This fast-moving, practical book is loaded with great ideas that help you to focus, concentrate, and get more things done faster than ever before. This book presents a holistic approach to putting work into perspective. It gives you tools to control the daily deluge of action requests, and new ways to successfully create your goals and to connect more meaningfully with your career. If you want to get your workday totally together, get this book. To go beyond Michael Linenberger's One Minute To-Do List and MYN task systems, you'll want to read Michael's book Master Your Workday Now! This book teaches you how to rise above control-based tasks systems and into methods of transformation by creating goals and work visions that really deliver! "Goal" Is NOT a Four-Letter Word! Goal setting can be a very useful tool. However, most people I meet in the corporate world hate the goal setting and review process. It's usually imposed on them by management, and they never buy into it. It feels artificial, and it doesn't connect with their real priorities. But goal setting doesn't have to be that way! This book shows you positive and powerful ways to create and achieve goals that match who you really are—that match your true priorities. And feel happier, and more richly fulfilled, than ever before! Learn more ways to control tasks. Learn how to create Vision Goals, that help you take command of your bigger achievements. Connect your work with who your really are, so that your work is enjoyable and most powerful. Master Your Workday Now! is a cutting-edge foolproof solution to your overwhelmed workday, and mastering a productive life. Follow these practices, and your daily tasks and e-mails will be well managed, goals will be clear and achievable, and your career will be on purpose. I highly recommend it for anyone seeking to catapult their life to higher levels of success and fulfillment. Master Your Workday Now! offers a clear, simple, and amazingly effective system for freeing up your workday and connecting your daily activities to your bigger goals and purpose, so you can live a passionate life.